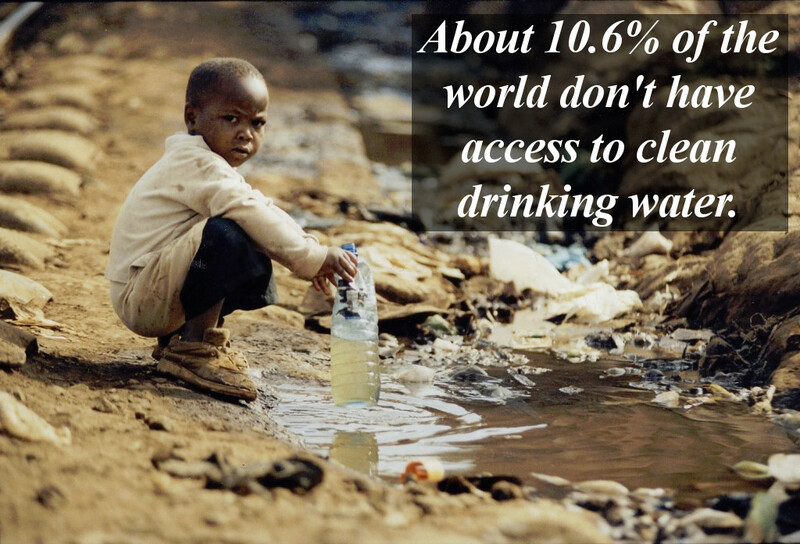 This such a sad stat about the current state of the world population's access to clean drinking water. Approximately 783 million people, or 10.6% of the world population don't have access to clean drinking water. The lack of clean drinking water causes many illnesses and diseases which greatly hinder people's ability to live and grow as a society. If you put it in perspective almost 1 billion people or 1 in 10 people have to drink dirty water that can severly affect their life. This problem highlights the importance that each and everyone in the world must not take water for granted and always look to help out the parts of world that need it the most. But the positive side is that there is more than enough clean drinking water in the world for everyone but it is only when as individuals and corporations avoid monopolizing and restricting water for money or power. This statistic also highlights how where your born greatly affects your entire life. So we should always be mindful that we are responsible to the misfortuned and never be too caught up in our accomplishments because the circumstances in which we are born are often the biggest factor to them. Thus always look to help others, and giving everyone access to clean drinking water is at top of the list and should be a goal we, the fortunate ones, need to accomplish!